400 series syringe barrels are cost effective components available in sizes from 1cc to 60cc. Use with air-powered dispensers or as a manual hand-held syringe assembly with rubber piston and push rod. If using with an air-powered dispenser, a 400 series adapter is required and it is best to select using plastic pistons. If using manually, select a rubber piston and a plastic push rod. Manual syringes are also available supplied pre-assembled in sealed packs. 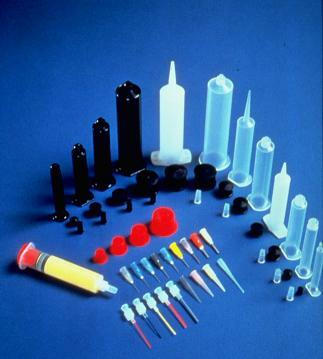 Syringe barrels are low cost reservoirs that can be used with air-powered dispensers or as manual syringes when used with a rubber piston and plastic plunger rod. Pistons wipe the syringe insides as liquid is dispensed by a close tolerance fit. This eliminates air entrapment and fluid shear. Pistons are available in 3 styles for dispensing by hand or from an air-powered dispenser. Barrel adapters are the link between the air-powered dispenser and the syringe barrel. Precision moulded for a safe and secure barrel attachment. Clear Adapter Tubing Per ft. Clear flexible air tubing for use with adapters Clear 10 per 10 ft.